While lopsided majorities of Hispanics and Asian Americans support creating a pathway to citizenship for unauthorized immigrants, two new surveys from the Pew Research Center also show that these groups believe it is more important for unauthorized immigrants to get relief from the threat of deportation. By 55% to 35%, Hispanics say that they think being able to live and work in the United States legally without the threat of deportation is more important for unauthorized immigrants than a pathway to citizenship. Asian Americans hold a similar view, albeit by a smaller margin—49% to 44%. Together Hispanics and Asian Americans account for two-thirds of the 28 million immigrants who are in the U.S. legally,1 and Hispanics alone account for about three-quarters of the additional 11.7 million immigrants who, according to Pew Research Center estimates, are in the country illegally. The U.S. Senate passed a bipartisan immigration reform bill during the summer, but the measure remains stalled in the Republican-led House of Representatives, where the provision that provides a 13-year pathway to citizenship for unauthorized immigrants has emerged as the major sticking point. Pro-immigration reform leaders staunchly support that provision, as do large majorities of Hispanics (89%) and Asian Americans (72%), according to the new Pew Research surveys. However, the findings from the same surveys of both groups show that, when dealing with the issue of unauthorized immigration, deportation relief is more important than a pathway to citizenship; this could conceivably create an opening for legislative compromise. Immigrants in the U.S. fall broadly into one of three categories. They are either in the country illegally; are legal permanent residents; or are naturalized U.S. citizens. Those who are legal permanent residents are able to live and work in the U.S. legally (without fear of deportation) and to travel abroad, but are not afforded all the rights of U.S. citizenship. Naturalized U.S. citizens have all the benefits of legal permanent residency along with being able to vote in U.S. elections (in addition to other benefits). Not all legal immigrants necessarily choose to become U.S. citizens. In a report published earlier this year (Gonzalez-Barrera, Lopez, Passel and Taylor, 2013), the Pew Research Center found that among all Hispanic immigrants who are in the U.S. legally, just 44% have become citizens; the remainder are legal permanent residents. Among legal immigrants from Mexico, which is by far the largest country of origin for Hispanic immigrants, just 36% have gone through the naturalization process and become U.S. citizens. The surveys find that while large majorities of both groups say they have heard or seen at least a little about the legislation pending in Congress, roughly seven-in-ten Hispanics (67%) and Asian Americans (72%) also acknowledge they don’t know enough about the details of the bill to say if they support it or not. Still, immigration reform is important to both groups. Seven-in-ten Hispanics (69%) say it is important to them that new immigration legislation pass this year, as do 44% of Asian Americans. According to the new Hispanic survey, about six-in-ten (59%) Hispanic immigrants and 46% of all Hispanics say they worry “a lot” or worry “some” that they themselves, a family member or a close friend could be deported. By contrast, just 18% of Asian-American immigrants and 16% of all Asian Americans say the same. Immigrant Hispanics are especially supportive of deportation relief; by 61% to 27%, they say it is more important to unauthorized immigrants than having a pathway to citizenship. Among native-born Hispanics, these shares are 48% and 44%, respectively. The new surveys also find that large shares of both Hispanics and Asian Americans see upsides to granting legal status to unauthorized immigrants, in addition to downsides. Majorities of both Hispanics (76%) and Asian Americans (59%) say that granting legal status to unauthorized immigrants would strengthen the U.S. economy. And majorities of both groups (87% among Hispanics and 75% among Asian Americans) say doing so would improve the lives of undocumented immigrants. At the same time, majorities or pluralities of both groups say that granting legal status to unauthorized immigrants would reward illegal behavior (53% among Hispanics and 48% among Asian Americans) and lead to more immigrants coming the U.S. illegally in the future (51% among Hispanics and 61% among Asian Americans). How Well Does the U.S. Immigration System Work? The two new surveys also asked respondents about their experiences with and assessments of a wide range of U.S. immigration system policies and practices. Many more Asian Americans than Hispanics say they or their family members have had some personal experience with the U.S. immigration system—69% vs. 45%. This is not surprising given the greater share of Asian-American adults who are immigrants. Hispanics are more likely than Asian Americans to say the U.S. immigration system needs to be “completely rebuilt” or needs “major changes”—62% of Hispanics say that, compared with 47% of Asian Americans. Nonetheless, when asked about specific aspects of the U.S. immigration system, evaluations are generally positive for Latinos as well as Asian Americans. For example, on family reunification visas, 62% of Latinos say the system works “very well” or “somewhat well.” Among Asian Americans, 57% say the same. When it comes to getting legal permanent residency, three-in-four (74%) Hispanics and 69% of Asian Americans say the system works very well or somewhat well. Similar shares of Hispanics and Asians Americans say the same about the process for getting visas for high-skilled work or work visas for international students who want to stay and work in the U.S. after they graduate. The Hispanic survey was conducted by landline and cellular telephone, in English and Spanish, from Oct. 16 to Nov. 3, 2013, among a nationally representative sample of 701 Hispanic adults. Its margin of error is plus or minus 4.4 percentage points at the 95% confidence level. The Asian-American survey was also conducted by landline and cellular telephone, in English as well as Vietnamese, Korean, Mandarin and Cantonese, from Oct. 16 to 31, 2013, among a nationally representative sample of 802 Asian-American adults. Its margin of error is plus or minus 5.0 percentage points at the 95% confidence level. For details on the surveys, see Appendix B. Some 85% of Hispanics and 83% of Asian Americans approve of increasing the number of temporary work visas for highly skilled workers. Some 85% of Hispanics and 79% of Asian Americans say they approve of increasing the number of temporary work visas for agriculture and food industry workers. About seven-in-ten (68%) Hispanics and 73% of Asian Americans support a proposal to increase enforcement of immigration laws at U.S. borders. About six-in-ten (57%) Hispanics and 30% of Asian Americans say increasing the number of temporary work visas for agriculture and food service workers would help the U.S. economy “a great deal.” Half of Hispanics (52%) and Asian Americans (47%) say increasing the number of temporary work visas for high-skilled workers would help the U.S. economy a great deal. Among Hispanics, 32% say the issue of immigration is an “extremely important” one facing the nation today. Among Asian Americans, just 17% say the same. For both Hispanics and Asian Americans, the surveys find that among five domestic issues tested—jobs and the economy, education, health care, the federal budget deficit and immigration—immigration ranked last. Foreign-born Latinos are more likely than native-born Latinos to say it is important that significant new immigration legislation pass this year—80% vs. 57%. About four-in-ten (38%) Hispanics say the overall effect of unauthorized immigration on Hispanics already living in the U.S. has been positive, 26% say it has been negative and 31% say there has been no effect one way or the other. Among Hispanics, the foreign born are more likely than the native born to say the effect of unauthorized immigration on U.S. Hispanics has been positive—45% vs. 30%. Among Asian Americans, 21% say the effect of unauthorized immigration on Asian Americans already living in the U.S. has been positive, 25% say it has been negative and 44% say there has been no effect one way or the other. Effect of Unauthorized Immigration on Hispanics and Asian Americans Living in the U.S. Majorities of Hispanics and Asian Americans say they are satisfied with their lives today—81% and 82%, respectively. This is similar to the 81% of the U.S. general public who say the same. Hispanics and Asian Americans are more likely than the U.S. general public to say they are satisfied with the way things are going in the country today—34% and 38%, respectively, vs. 14%. Overall, Asian Americans are more upbeat about their personal finances than the U.S. general public and Hispanics. Half (54%) say their finances are in “excellent shape” or “good shape.” By contrast, 40% of the U.S. general public and 37% of Hispanics say the same about their finances. This report explores Hispanics’ and Asian Americans’ views of new immigration legislation being considered in Congress. It also explores the attitudes and opinions of each group about the Republican Party, the Democratic Party and President Obama and examines their views of and experiences with the U.S. immigration system. The report is based on two nationally representative surveys fielded in all 50 states and the District of Columbia. The first is a bilingual telephone survey of 701 Hispanic adults conducted from Oct. 16 to Nov. 3, 2013. The margin of error for the full Hispanic survey sample is plus or minus 4.4 percentage points at the 95% confidence level. Interviews were conducted for the Pew Research Center by Social Science Research Solutions (SSRS). The second is a multilingual survey of 802 Asian-American adults conducted Oct. 16-31, 2013. The margin of error for the Asian-American survey is plus or minus 5.0 percentage points at the 95% confidence level. Interviews were conducted for the Pew Research Center by Abt SRBI. For details on each survey, see Appendix A. Data on the demographic characteristics of each group come from the U.S. Census Bureau’s Current Population Survey. This report was written by Mark Hugo Lopez, Paul Taylor, Cary Funk and Ana Gonzalez-Barrera. The authors thank Jon Cohen and Jeffrey Passel for editorial guidance. Anna Brown provided research assistance. Eileen Patten and Gretchen Livingston number-checked the report. Marcia Kramer was the copy editor. Find related reports from the Pew Research Center’s Hispanic Trends Project online at pewresearch.org/hispanic. The terms “Latino” and “Hispanic” are used interchangeably in this report. 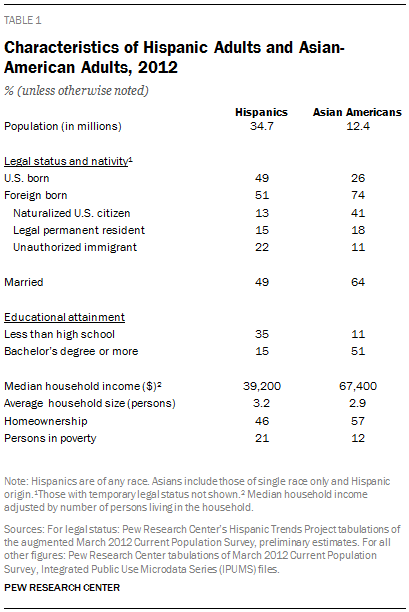 The terms “Asian Americans” and “U.S. Asians” are used interchangeably in this report. The terms “unauthorized immigrant” and “undocumented immigrant” are used interchangeably in this report to describe immigrants who are living in the U.S. illegally. Unless otherwise noted, Hispanics are of any race. Asian Americans can also be Hispanic. 4. Legal Immigration in the U.S.